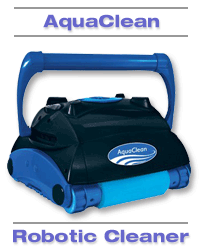 AquaClean Robotic Pool Cleaner ACLEAN1 - Free Shipping! AquaClean Robotic Cleaner utilizes Aqua Smart system technology which drives the cleaner to efficiently clean the entire pool every time. Residential pools up to 860 sq.ft. are thoroughly scrubbed, cleaned and filtered in just 90 minutes. Recommended Pool Size Up to 860 sq ft.